California’s Desert Sunlight and Topaz solar generation farms photographed from space. California has always taken pride in being on the cutting edge of technology but in the case of solar, it may be catching up with some of its south-western peers in the United States. The Terra satellite used the on-board ASTER (Advanced Spaceborne Thermal Emission and Reflection Radiometer) imaging system to take these pictures of two solar farms in California. On the left is First Solar’s Desert Sunlight solar generation facility that has recently come on board. It is expected to generate 550 MW of electricity from Riverside County. On the right is the the Topaz solar farm in San Luis Obispo County generating a similar amount of electricity. NASA’s Terra spacecraft which studies Earth captured a couple of volcanoes in Guatemala, including one – Fuego – that had just erupted. Located just 35 kilometers from the capital Guatemala City, the ash and steam released from Fuego closed down the city’s airport. Fuego is seen on the left hand side of the picture, with the smaller inset showing a thermal IR view from the Advanced Spaceborne Thermal Emission and Reflection Radiometer (ASTER) instrument. 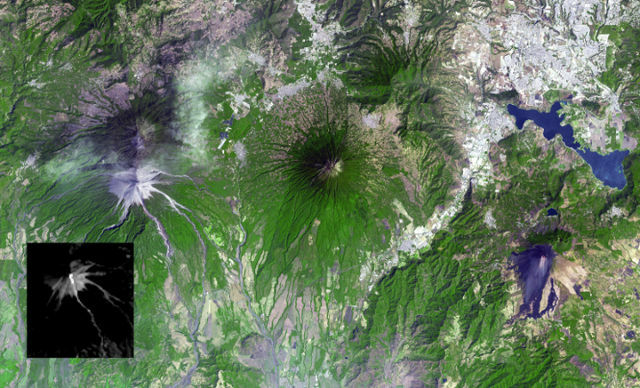 Other active Guatemalan volcanoes shown in the image are the Acatenango (top), Volcano de Agua (middle), and Pacaya volcano (right). Space enthusiasts around the world were filled with excitement just over a month ago when the Indian Space Research Organization’s Mars Orbiter Mission successfully placed the space probe into Martian orbit. But in November 2013, while it was still in Earth’s orbit, it used its Mars Colour Camera, at a wide 3.53 kilometer resolution, to take this picture of Earth. 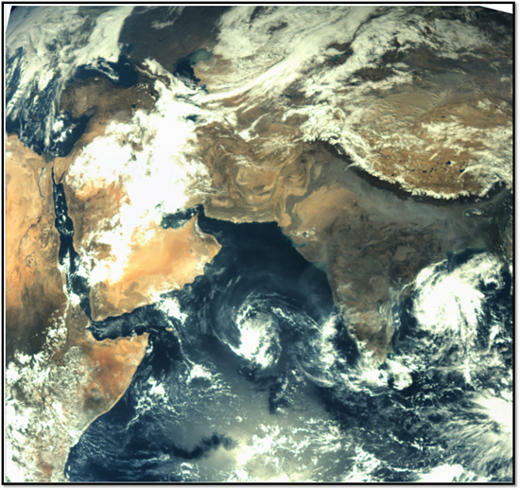 The picture captured the Indian subcontinent along with the Middle-East, parts of China, Eurasia and Africa with interesting weather patterns visible over the Indian Ocean and Arabian Sea. The drought cycle in California has seen an immense increase in the pressure being felt by residents of the state and its surrounding region. 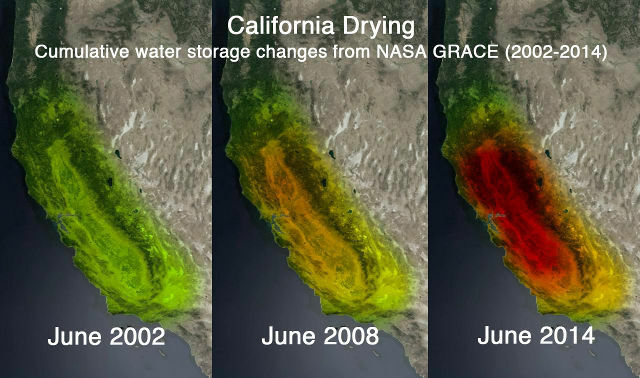 NASA’s Gravity Recovery and Climate Experiment (GRACE) has been taking satellite images of the declining level of groundwater/aquifers in California, with the loss in water supplies shown here transitioning down from 2002 to 2008 and finally at their lowest level so far in 2014. The greatest losses have been suffered by the Sacramento and San Joaquin River basins which include the fertile Central Valley – a large consumer of water used for agriculture. Gold is a metal that has several unique properties and has long held a special place in human society. Whether its origins lie in supernova nucleosynthesis or the collision of neutron stars, gold has been associated with value due to its rarity, malleability, resistance to corrosion, pleasing colour and specialized industrial applications. Gold’s symbol is Au and its atomic number is 79. 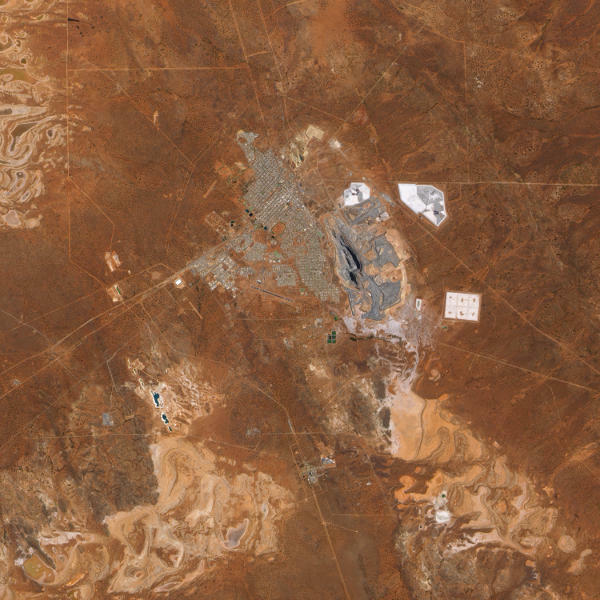 The Advanced Land Imager on NASA’s Earth Observing-1 took this picture of the “Super Pit” gold mine near the town of Kalgoorlie which lies in the semi-arid region that is Western Australia. This open pit gold mine is a joint venture between Barrick Gold and Newmont mining. It produces approximately 850,000 ounces (28 tonnes) of gold per year.